Hello TCS families. We trust you have had a good week. Here are a few news items that we wanted to share with you. Have a great and safe weekend! Fifty-four high school students qualified for 2nd Quarter Pioneer Rewards Lunch this week. Students had the opportunity to go to lunch at Mark Pi’s, Jimmy Johns, Bigby, or Dunkin Donuts/Baskin Robbins. 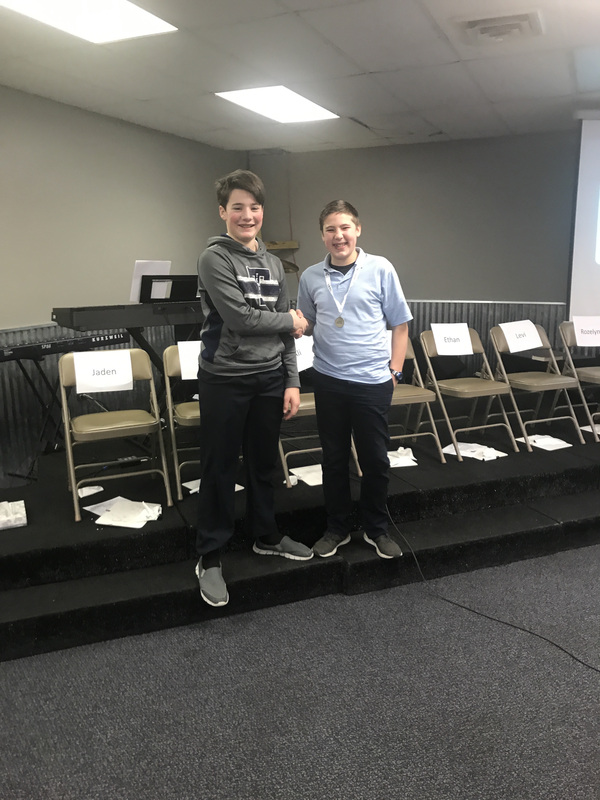 Forty middle school students had the opportunity to attend Middle School rewards Wednesday, which consisted of free time in the lunchroom with plenty of candy for all who attended! Each quarter, students in the elementary are rewarded with Pioneer Bucks for working hard in class and demonstrating extraordinary character. 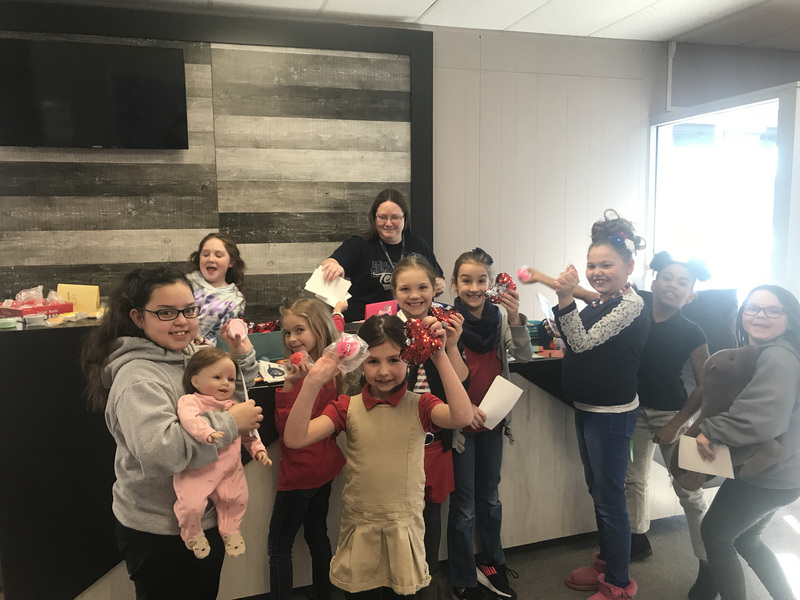 Today, students got to cash in their Pioneer Bucks for slime, squishy toys, reversible sequins hearts, and many other fun items. We love to reward students for being great examples and leaders in our school! Temple sophomore Lindsey Stump recently auditioned and was selected to participate in the 2019 Ohio Music Education Association District 3 HS Honors Festival Choir. The District Honors Choir and Band rehearsed in Van Wert on two Saturdays over the last few weeks, and the Festival was scheduled to culminate with a concert at the Niswonger Performing Arts Center this past weekend. Unfortunately, the Festival was cancelled due to Winter Storm Harvey. Nevertheless, Lindsey represented TCS well at the rehearsals, and we are very proud of her achievement! 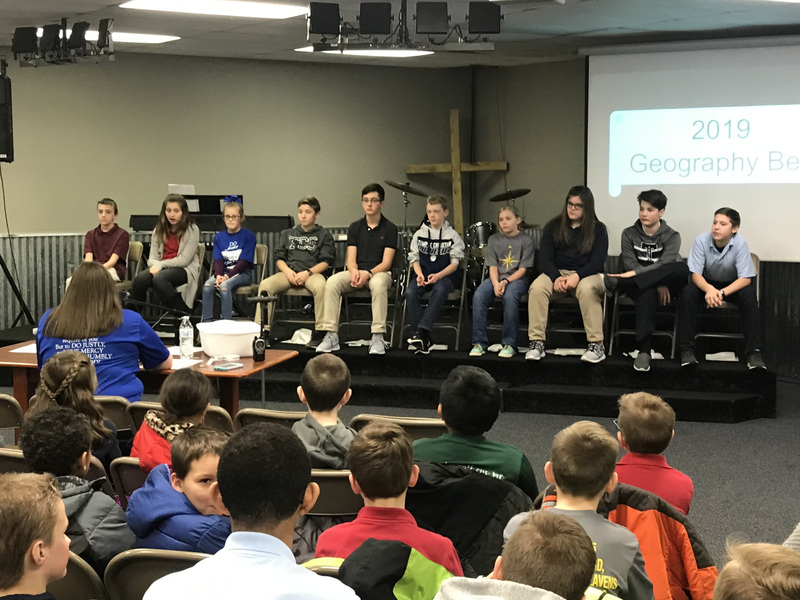 Temple’s annual Geography Bee was held on Wednesday January 23rd. 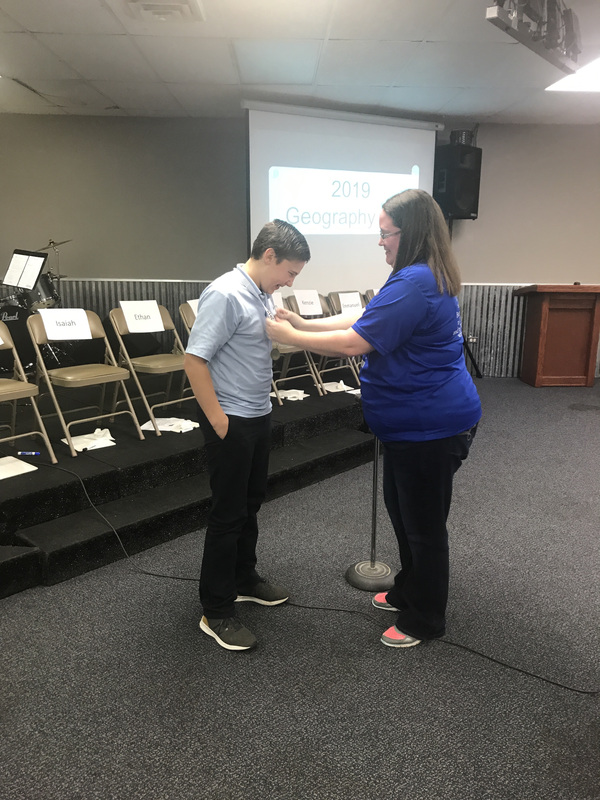 We had twenty-three students in grades 4-8 participate in the Geography Bee this year. Ten students participated in the final round on Wednesday. Our third place winner was Ethan Wright who received a $10 gift card. Our 2nd place winner was Emmanuel Powell who received a $15 gift card. Our school champion was Caleb Kiser who received a $25 gift card and a championship medal. All twenty-three participants enjoyed a pizza party on Friday. How do good readers become great readers? Practice! Every spring we host a Scholastic Book Fair to make it easy to put terrific books in your child’s hands. This year’s book fair will be open March 5-8. As always, we are looking for volunteers to help set up, run and tear down the book fair. If you are available to help for a few hours some time that week, please contact Amy Link in the elementary office at 419-227-1644, ext. 1 or linka@tcspioneers.org. Thanks! When Lima City Schools, Elida, Bath, or Shawnee have a delay and TCS does not, bus pick-ups will follow your local school district delay. When Lima City Schools, Elida, Bath, or Shawnee do not delay but TCS does, bus pick-ups will follow the TCS delay. When Lima City Schools, Elida, Bath, or Shawnee are cancelled and TCS is not, no buses will run to TCS from your respective district. Please check www.homestations.com for delays and cancellations. Honey Gram order forms were sent home with students on Wednesday. Please remember to use a different form for each person you are sending a Honey Gram. Seniors will distribute the shirts before Valentine’s Day, so the students can wear them on Valentine’s Day. All other items will be distributed on Valentine’s Day. If you have a child who does not attend school on Thursdays (K4 or younger), please mark that on your order form. We will be sure to deliver those on Friday instead of Thursday. The money raised goes toward the senior class trip to Washington D.C. Remember, we would love to see Mr. Bowman wearing an Olive You t-shirt on Valentine’s Day! The JV and Varsity high school cheerleading squads are hard at work planning a fun week of Cheer Camp for girls in grades K4-6th. Camp will take place on Monday January 28, Tuesday January 29, and Thursday January 31 from 3:00-5:00 P.M. The girls will perform at the boys’ varsity basketball game on Saturday, Feb. 2nd. We look forward to a fun week with our Little Pioneer Cheerleaders! We will be holding an informational meeting regarding the College Credit Plus Program for the 2019-20 school year on Feb. 7th at 6:30 P.M. in the high school lunchroom. The meeting is for any middle school/high school students (and their parents) who are interested in taking college courses next year. Several current TCS students are taking advantage of the state’s CCP Program, which allows students to take college courses for dual college/high school credit at no expense to the students. Re-enrollment for the 2019-20 school year is scheduled to begin on February 11th. Thank you for choosing Temple for your children. We consider it a blessing to partner with you in your child’s education. Renewals for Edchoice Scholarships begin on February 1st. Please see Amy Link in the elementary office for information about renewing your Edchoice Scholarship. We will be having a Military Appreciation Night at tonight’s Varsity/JV boys’ basketball game vs. USV. Veterans and current members of our military will receive discounted admission ($2.00) and one free popcorn or beverage. We will be having Parent Appreciation Night at the Varsity/JV boys’ basketball game vs. Vanlue on Saturday night. There will be discounted items in the Spirit Store and Gift Card Drawings for TCS parents. Fri. Jan. 25 Varsity/JV Boys Basketball at Home vs. USV @ 6:00 P.M. Sat. Jan. 26 Varsity/JV Boys Basketball at Home vs. Vanlue @ 6:00 P.M.
Mon. Jan. 28 JH Boys/Girls at Hardin Northern @ 5:00 P.M.
Tues. Jan. 29 Varsity/JV Boys Basketball at Miller City @ 6:00 P.M.
Fri. Feb. 1 Varsity/JV Boys Basketball at Hardin Northern @ 6:00 P.M. Sat. Feb. 2 HS Bowling at TP Lanes Bellefontaine vs. Perry, Elgin, & Riverside @ 1:00 P.M. Sat. Feb. 2 Varsity/JV Boys Basketball Home vs. Emmanuel Christian (Toledo) @ 6:00 P.M.
Feb. 7 MS/HS College Credit Plus Meeting in Lunchroom @ 6:30 P.M.